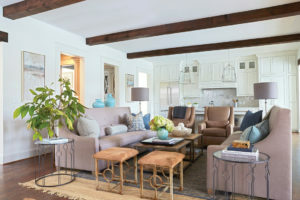 Located at the Preserve in Hoover, the 2014 Birmingham Home and Garden Inspiration Home is a two-story painted brick home featuring a porch and second story balcony. In keeping with the traditional feel of the community, the home exhibits traditional Southern style, but with modern amenities. Once inside, a grand hallway leads to a welcoming, open floorplan that brings together an expansive living room and kitchen. Look for details such as the built-in banquette, beamed ceiling, and large mudroom. Other interesting design treatments include the arched double shower in the master bath, covered outdoor kitchen, and pool overlooking the valley beyond. This year, our home will feature the styles and designs from some of Birmingham’s top retailers and manufacturers. Each room will showcase the best of what’s in store and creative ways for displaying and arranging. Shop the interiors for dressing your own home (Yes! Everything is for sale! ).